Should I Roll My Current Car Loan Into My New One? Maybe you need a newer, more reliable car, or perhaps you need a bigger car. For whatever reason, you’re considering trading in your current car for a newer one—but you still owe money on your current car. As a result, you may be wondering how to deal with your existing car loan. It's common for people to trade in their current car when purchasing a new car, and, if the current car is not yet paid off, the dealer offers to roll the current car loan into the new one. However, you should carefully consider your options before taking this route. Consider several factors before rolling your current car loan into a new one because this situation could put you in financial hot water. The biggest danger of rolling your current car loan into a new one is that you could end up owing more on the loan than your car is worth, which is called being upside down on the loan. This can make selling your car even more difficult in the future. If you buy a new car, you are automatically upside down on the loan since the car depreciates as soon as you drive it off the lot. When you add in your current loan, then you compound the problem. To avoid this, consider buying a used car or even paying in cash. A car salesman’s job is to talk you into buying the car on the lot. When you remember that, you will realize that every deal offered to you may not be quite the deal that you think it is. Before you even start shopping for a car, you should determine if you want a new or a used one. You can often receive more money for your car if you do a private sale. This is not a complicated process, and you can use the money to pay off your current car loan. If you still owe money on the current car loan after you have sold the car, you will then need to contact your bank to transfer the loan into a personal loan or find the money to pay the difference. Once you sell the car, you will transfer the title over to the new owner. The best option when you need to purchase a car is to pay entirely in cash. However, that may not always be possible. If you do have to finance the car, make sure you can afford the payments in your budget with room to spare. One of the most common issues people encounter is buying a new car they can't really afford. As a result, their monthly car payments are too high, causing them to struggle financially. Before you go car shopping, determine how much you can afford to pay each month, keeping your total debt load (including your rent and house payment) at less than 30 percent of your monthly income. Ideally, you should be able to pay off your car in three years. You may be better off if you find your own financing for the car, rather than using the dealer financing. You may be able to find a better interest rate, particularly if you are buying a used car. Credit unions and small banks often offer better interest rates on car loans, especially to repeat customers. You can contact the credit union to gain pre-approval for a certain amount before you begin car shopping. This will help you decide on your price range. Don’t be afraid to negotiate the price with the car dealer before you buy the car. Car prices are definitely negotiable, and you may also be able to negotiate the down payment amount, interest rate, or other terms. If you hate to haggle, check the car prices at a no-haggle dealer such as CarMax and compare them to see who can offer you the best price. Some car companies will even offer you a lower interest rate if you buy a new car, and you may think this is the best option because you will save interest on the loan amount. However, a car takes the biggest hit of depreciation in its value over the first three years of its life. 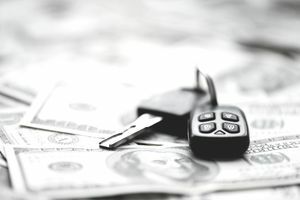 You may end up losing as much in resale value as you would save in interest when buying a used car, so be sure to do the math before signing on the dotted line. Another important factor to consider when purchasing a car or rolling your current car loan into a new one is to not get caught up in the moment. Before going to the dealership, research cars at home, taking into account factors like price, reliability, equipment options, gas usage, and whether a new or used model fits best with your needs and lifestyle. Take a day or two after you go car shopping before you make your final decision. Finally, make sure you can truly afford the car payment to which you are agreeing. You do not want to end up regretting the purchase for a long time or being stuck with a car payment you really can’t afford. For your next vehicle, try saving up cash to buy your car outright. Should I Ever Use a Credit Card Instead of a Debit Card? Are Interest Free Car Loans a Good Thing? Is a Personal Loan or a Credit Card Better for Your Next Loan? What If My Spouse Stole My Identity? Should I Consolidate My Credit Card Debt Into a Second Mortgage? Is a Second Mortgage a Good Option?